The temperature hit 62 degrees yesterday afternoon. 62 degrees! I know, I know. It’s gray today, and cooler. Winter’s probably crouched behind a parked car or a park bush, just waiting for us to shed a few layers so it can jump out and sock us with a cold sucker punch. Still, 62 degrees! I mean, if it looks like a duck and quacks like a duck, well, I’m going to call it spring. This pair of New Yorkers was enthralled by a pair of mallards bobbing in the Hudson. Crazy nesting behavior abounds. 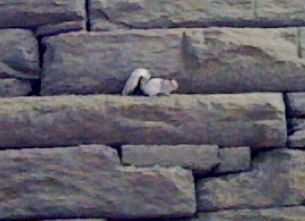 Squirrels run up and down the retaining wall, their mouths stuffed with leaves to use as nest material. At the feeders, the ever-present, ever-hungry Downy woodpecker was, as usual, gorging on a suet cake, and a shy tufted titmouse with a huge sweet voice called, “Peter, Peter, Peter” over and over, but kept its distance. We walked south along the Greenway, detoured into the park and came back out to the river below 81st Street. The Riverside Red-tailed hawks built a new nest after winter winds sent last year’s nest tumbling to the ground. I thought I found the new nest high in a honeylocust tree. 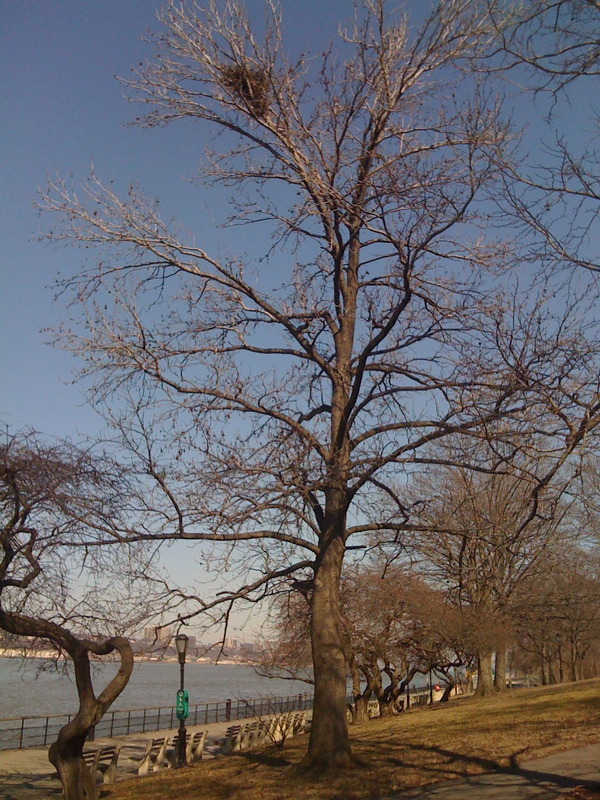 Is this the new nest of the Riverside Red-tailed hawks? Now I’m not so sure. Might be just another squirrel drey. See, Urban Hawks has posted photos of the female red-tail sitting on the new nest, and the tree doesn’t look anything like my tree. Guess I’ll have to go back with binoculars. Heading home, we admired the locked entrance to the train tracks. Looks like something out of Shutter Island. 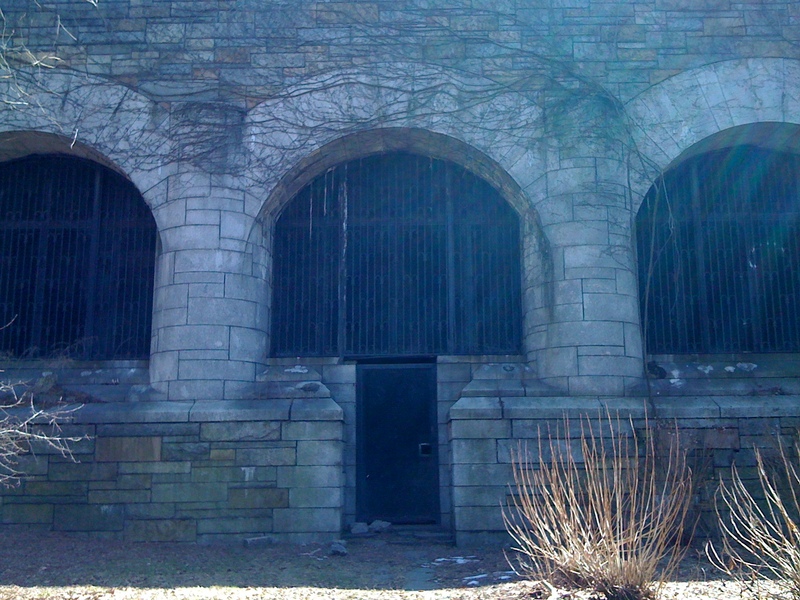 When I was a teenager roaming in Riverside Park, we found our way inside some kind of train house. I remember a vast cavern with giant machinery. Anyone know what I’m talking about? 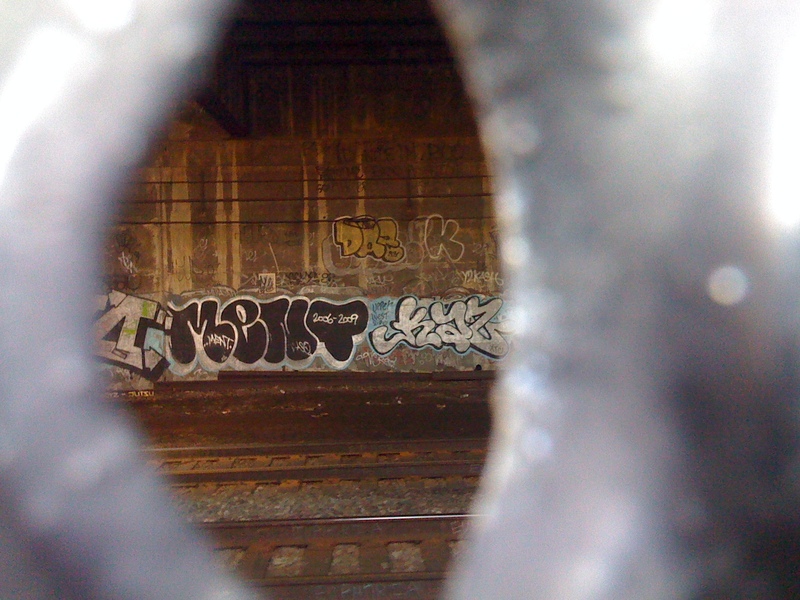 Peering inside the gate, we catch a glimpse of the graffiti said to cover much of Freedom Tunnel. On the walkway above the tunnel, a brave little sparrow tried valiantly to untangle a huge ball of string and fluff from one of the train tunnel gratings. While I wished it success in its Herculean efforts, I worried about the string, which can wind around a bird’s leg, choking off circulation. Back on the street, we see an unmistakable sign of spring. 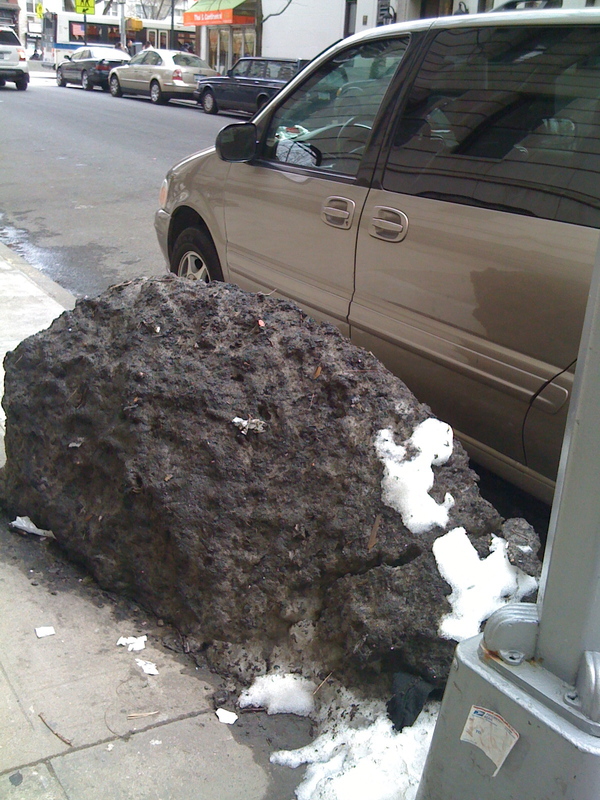 A black crusty blob of snow (yes, really, that is snow) has been threatening to become a permanent resident of 108th Street, but the warm weather appears to be thwarting its evil plan. 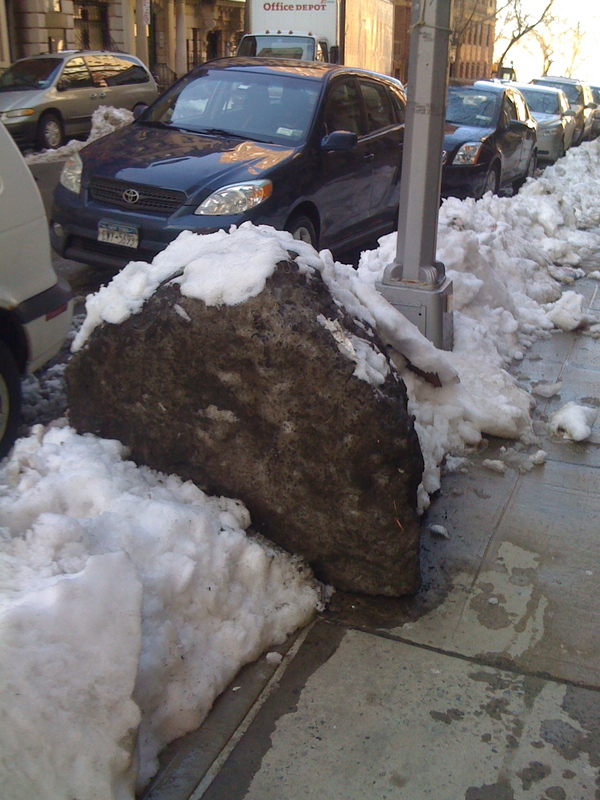 Not a meteorite, just New York City snow. And finally, Mister Softee, an early spring migrant, was singing his cheerful if repetitive song from his usual warm-weather perch on 109th and Broadway. Much remains unknown about Mr. Softee. Researchers have yet to discover where he spends the winter months, where he breeds or – and this is of particular interest to me – the identity and whereabouts of Mrs. Softee. Nonetheless, Mr. Softee remains a welcome sign of spring in New York City, right up there with the arrival of warblers in Central Park. 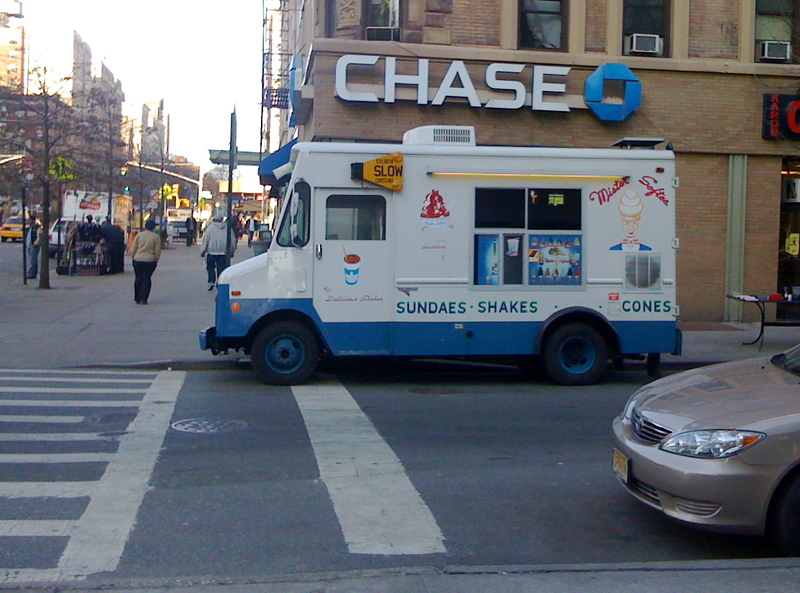 Welcome back, Mr. Softee. Goodbye, Black Crusty Snow. This entry was posted on March 11, 2010 at 4:10 pm and is filed under 2010, Birds, In the City, March, Squirrels, Wildlife/Natural History. You can subscribe via RSS 2.0 feed to this post's comments. My favorite new expression of all times will be: the humiliating wreckage of false identifications. brilliant! 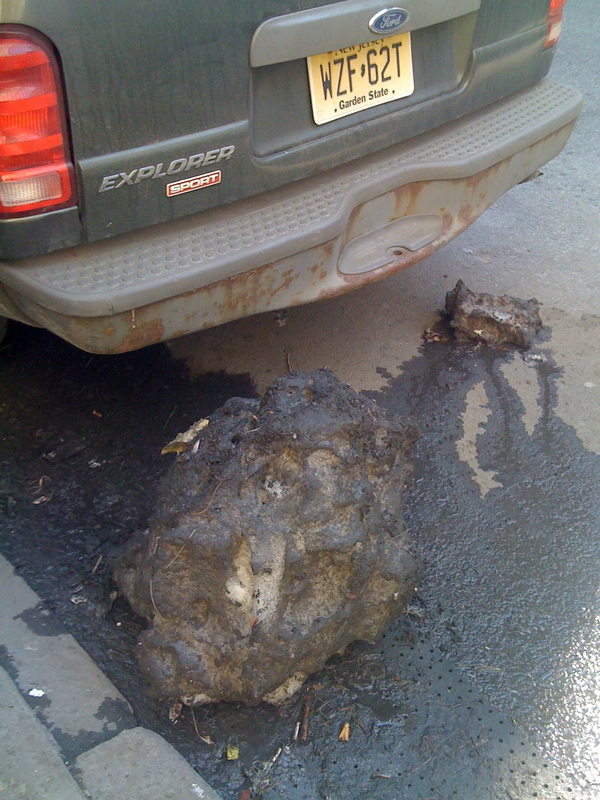 This post is hilarious, from the black snow blob to Mr. Softee. And funny too you should mention Mr. Softee, as Tom and Mekko partook the other day after seeing David Letterman. They might’ve regretting seeing DL but they loved having Mr. Softee! Also those pix of Shutter Island spookily good. Dreys are pretty much all leaves, so while they may be as large as some bird nests, they don’t have any of the twigs you’d see making up a crow or hawk nest, which are generally the big ones we get around here. Of course, sometimes its hard to see that detail w/o bins. PS, while there are jerks everywhere, (you know that living in NYC), I wouldn’t be too worried about mis-identifications. It’s one way to learn. And to those tossers who gloat over your being wrong, well, eff-em, they’ve got nothing to offer or share. Thank you, Matthew. I’m a great admirer of dreys, and thought I knew the difference. When I stood at the base of the tree and looked up, I was sure I was looking at sticks. But when I got home, I wondered if I had o’erleapt careful observation and landed squarely in an unfounded assumption. So when the weather clears, I’ll head back with binos & see. By the way, I love your new blog. Readers, go to Backyard and Beyond for Brooklyn nature.